The new Beef Data and Genomics Programme aims to dramatically improve maternal traits in the national herd over the next six years. 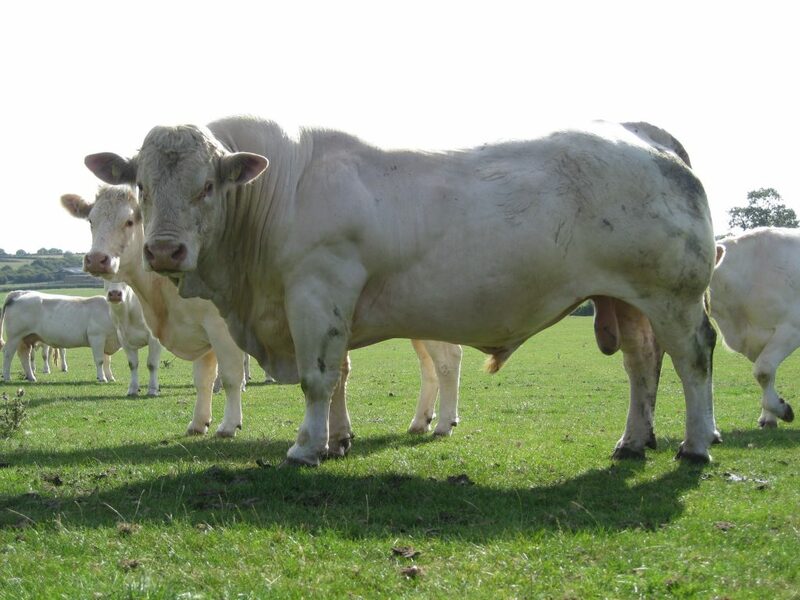 One English farmer selecting for maternal traits has shown that Charolais can make an ideal suckler cow. 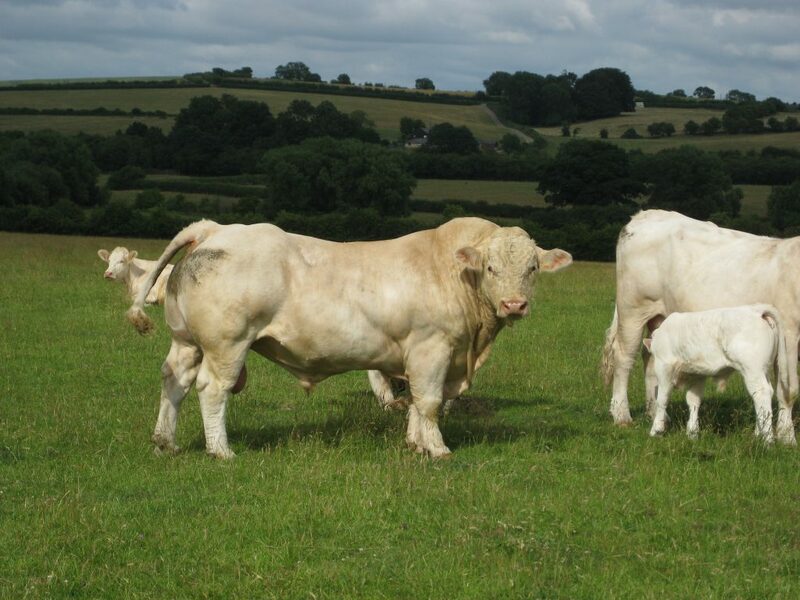 “We want a calf per cow per year with minimal hassle” says father and son team John and George Morris, who run the 300-cow Dorcas Charolais herd in Buckinghamshire, England. A flock of 1,200 pedigree Llyen ewes are also farmed on the 500-acre holding. The Dorcas herd was established in 1992, by purchasing cows from dispersal sales and herd reductions. The need for maternal selection soon became apparent as the majority of the cows calved down with very little milk. “Once a Charolais calf gets up, you know that nothing can beat it for growth rates and weight, but if you lose it calving then all that goes out the window,” George says. “Our maternal selection over the past 23 years has bred a herd of midframe cows with plenty of milk, longevity, excellent fertility and good temperament,” he says. The search for top-quality maternal AI straws has led the Morris’ as far afield as Canada, Australia and Sweden. John attends the annual Charolais Congress, which is held in a different country each year. “If he finds bloodlines he likes, we tend to try some of that country’s genetics,” George says. In October 2013, a contingent of 30 Swedish farmers attended a Dorcas Charolais farm walk. On a reciprocal visit the following year, John was impressed by the quality of the stock he saw and imported high EBV Swedish AI straws. For the past two years, the top 10% of the Dorcas herd has been bred to Swedish AI bulls. “Some of the bulls we’ve used recently have over 6,000 daughters on the ground, so they have good reliability,” George says. The herd is calved year round, although the majority of cows are calved in spring. Calves are weighed at birth, with an average birth weight of 50kg. Only heifer calves that are born and suckle unassisted are selected as potential replacements. George says that they want to stay away from big soft calves that take a few days to suckle. The Morris’ are committed to easy calving genetics because they are a family business calving 300 cows, and lambing 1,200 Lleyn sheep. Calving problems are not tolerated because in essence they don’t have time for the problems they cause. The winter dry cow diet is based on ad lib straw with a ration fed every second day. The ration is mixed by volume at 50% rolled barley, 25% crushed beet pulp and 25% Trafford’s Gold. It’s quick and easy to feed and we have no problems with big calves at birth, George says. Bull calves are finished under 16 months on the same ration fed ad lib. Average carcass weight is 420kg with a KO% of 60%. Heifers are finished at 24 months of age. “The maternal focus isn’t effecting our grades, our bulls are still grading 10% E and 90% U,” George says. 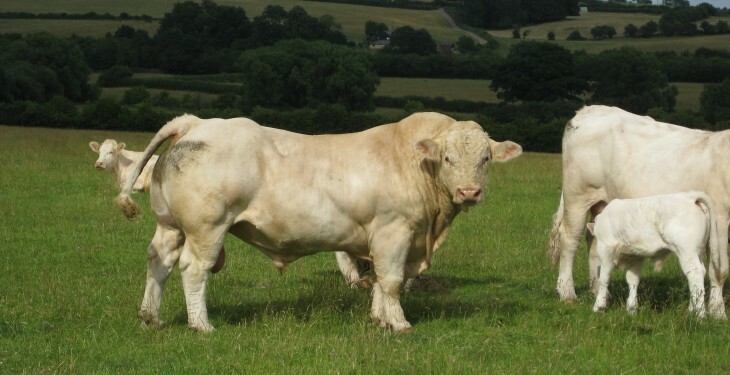 Having won the South Eastern Charolais Society large herd competition in 2014, Judge Murray Lyle praised the Morris family saying, without doubt, Dorcas is one of the best large herds in the UK, of any breed. “Dorcas is a herd of functional, sustainable Charolais cattle and a pleasure to visit,” he says. “Although we are a Pedigree herd, our outlook is unashamedly commercial. 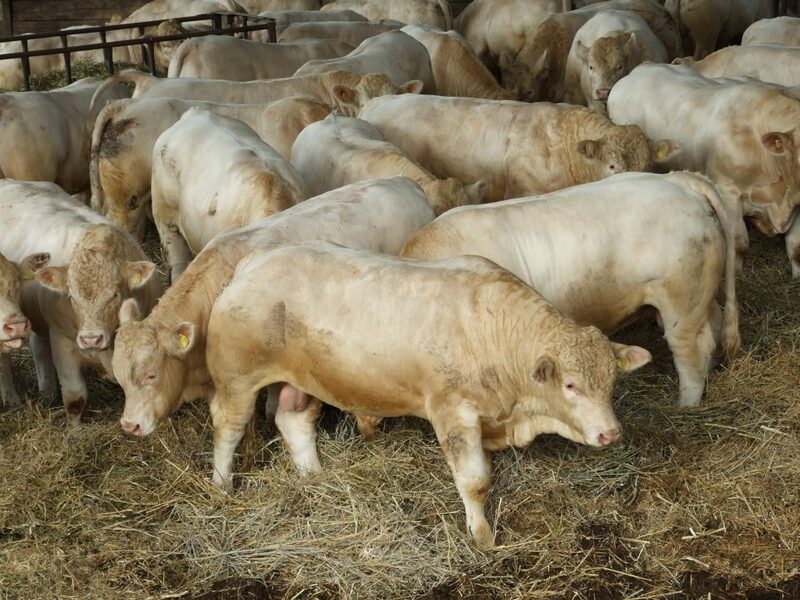 Many commercial producers are put off using a Charolais bull because of calving fears. “We want anyone buying a Dorcas bull to be confident about calving from it,” George says. Michael Cox, from Rathowen, Co. Westmeath, is a student of animal science at UCD. He won an ASA scholarships, sponsored by AIB, to help him undertake the work experience element of his course overseas, including the UK.